If you are a teen who is thinking about hurting yourself, it’s important to know that your pain is real, but suicide is not the answer. There are so many people out there that truly care about you who want to help. In addition, the resources available to you are abundant. Use this toolkit for quick access to those resources, as well as healthy ways to cope with the pain you are feeling. With all the information being thrown at you in school, it can seem like you are overloaded. Pair that with feeling hopeless, and it can leave you feeling like you are drowning. If you are currently struggling with how you are feeling, take a look at some of these helpful resources for easy, straightforward information. Your parents and caregivers can benefit from some of the information as well, guiding them in ways to help as you make your way back to the top. The families of two teenagers who committed suicide are claiming a popular Netflix series triggered them to do it. Two 15-year-olds from California took their own lives just days after watching the controversial series “13 Reasons Why” this April, according to their families who allege the series made it seem that suicide was the only option. The show centers on a high school girl that takes her own life and leaves behind 13 tapes detailing why she did it. It has since faced a slew of criticism for graphically depicting the way she ended her life. In 2013, suicide surpassed homicide as the third leading cause of death for kids in the US, a ranking it has retained ever since. The recession that began in 2007 is one reason suicide rates rose in the late 2000s and early 2010s. Guns are another. From 2002 to 2007, rates of firearm suicides among US kids were falling. But from 2007 to 2014, that figure increased 60% and is now the highest it has ever been, according to a study published recently in Pediatrics. It’s not just kids. “The rise in firearm suicides among children reflects the more widespread problem of increased suicide rates across the nation, particularly following the economic recession in 2007,” Katherine Fowler, lead author of the study and behavioral scientist at the Center for Disease Control and Prevention told Quartz in an email. Fowler said rates of suicide in the US have increased for all age groups, both sexes, among military and Veteran populations, and in both rural and urban communities. “What most people don’t realize is they’re not alone,” said Executive Director of Society for the Prevention of Teen Suicide Dawn Doherty. That message from leaders with the Society for the Prevention of Teen Suicide is growing more important than ever. As new data in a report published by the State Department of Children and Families shows suicide is the third leading cause of death for New Jersey youth ages 10 to 24. “Our intrinsic need is to figure out what the cause is so that we can figure out how to solve it. It’s multi-determinational and there are many, many reasons why that come together like a perfect storm, coupled with crisis thinking that would drive someone to do that,” said Clinical Director for Society for the Prevention of Teen Suicide Phillis Alongi. A middle schooler came close to taking his own life after receiving an onslaught of distressing comments in his yearbook from schoolmates who called him names and told him to kill himself, his mother said. The 13-year-old boy was left devastated last Friday after passing his yearbook around to other children at Glacier Middle School in Buckley, Wash., his mom wrote on Facebook. Inside, he found insults and curses, including “f*** yuo (sic)” and “piece of s***,” a picture of the yearbook showed. Other messages were even more sinister. Bullying has led to the suspected suicide of a 12 year old girl. 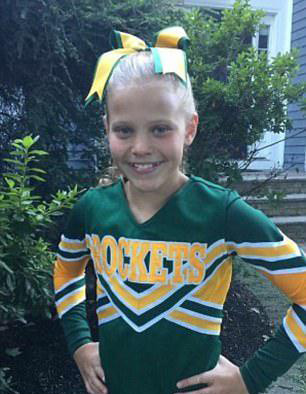 Mallory Grossman, a cheerleader and middle schooler in New Jersey say the seemingly happy young girl took her own life after being tormented by bullies on Snapchat. Official say that her death is still being investigated by cops and they aren’t ruling it a suicide yet. Her mom complained to administrators at the middle school about the alleged cyber-bullying just hours before her daughter’s passing. The growing number of fatherless children in this country poses one of the the most serious problems in education today, according to best-selling author Alan Blankstein. He has spent most of his life advocating for kids who struggle in school. He wrote Failure is Not an Option, a guide to creating high-performing schools for all students. So, just how many kids are fatherless? NPR Ed put that question to Blankstein, who told us that 24.7 million kids in the U.S. don’t live with a biological father. As she always does, Susan Blaha attended the District 135 annual awards ceremonies that honor her daughter’s memory. Last week, at the close of the school year, the AnnMarie Integrity Award for kindness, loyalty and friendship was presented to Ahlam Abdelrahaman Yasin, a soon-to-be eighth grader at Jerling Junior High, and to Klaudia Sieczka, a soon-to-be sixth grader at Century Junior High. The award includes a $500 grant that is made possible through the AnnMarie foundation, which has worked to educate parents and children about youth suicide. That work led to the 2015 passage of AnnMarie’s Law, which mandates that Illinois schools provide suicide and depression awareness and prevention education programs. In the weeks and months following the release of 13 Reasons Why on Netflix, much has been written about the scene in the series’ final episode depicting the main character Hannah’s death by suicide. However, suicide attempt survivors as well as an expert in the field believe that the scene’s explicit depiction of suicide has a number of huge problems that are more complex than the scene just being labeled as “bad”; they think the scene is both too realistic and completely unrealistic at the same time. Dese’Rae L. Stage, a survivor as well as the creator of photo series Live Through This, brings up that the scene’s “realism” is actually a central issue with it. “Given my own experiences as a suicide attempt survivor, I think it was a little too hyper-realistic,” she tells Teen Vogue. “It violates all of the guidelines set out by suicide prevention organizations about how to portray [and] report on suicide. It’s scary, it’s gory, and it’s very violent. It’s filmed close up; it never cuts away. The creators wanted to, essentially, scare young people away from suicide.” The problem, Stage explains, is that fear campaigns don’t work, and the show may have done more harm than good in showing people, particularly young people, how to use a specific method to take their own lives. In the past 15 years, there has been a 22% increase in the national suicide rate in the United States,1 while the total number of psychiatric hospital beds in the United States decreased from 34 to 22 beds per 100, 000 residents. This suggests that the availability of psychiatric hospital beds may be a risk factor in a complex network of suicide risk factors. Russian authorities have arrested a Moscow postman who allegedly ran an online game which led to 32 teenagers killing themselves. 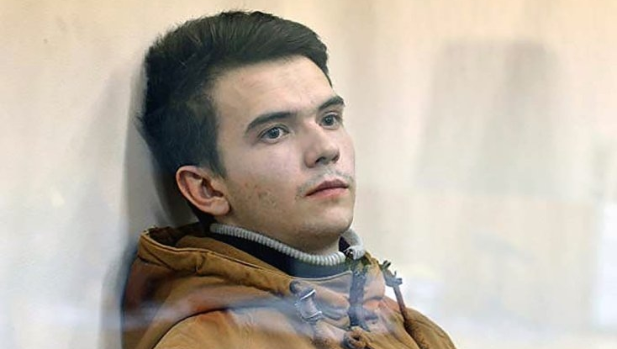 Ilya Sidorov, 26, is accused of encouraging vulnerable youngsters to self-harm and eventually killing themselves in a twisted game likened to the “Blue Whale challenge” that has been linked to more than 130 deaths. He has reportedly admitted to state investigators that he runs a ‘suicide group’ that have as many as 32 members. According to Mail Online, Sidorov was filmed sobbing as police interrogated about how he instructed a school girl to “jump under a metro train”. He was arrested and taken to Chelyabinsk region in the Urals on the charges that he encouraged a 13-year-old girl to kill herself. Michelle Carter is a haunting presence in court, looking on darkly as her troubled past — with eating disorders, deep social insecurities and talk of killing herself — is laid bare in her trial, for all the world to see. Most of the time, she appears to be on the verge of tears. Sitting in court, she has said nothing publicly. But her own words, in the form of thousands of text messages, make up the bulk of the evidence both for and against her in an unusual trial that began last Tuesday and could come to an end this week. Ms. Carter, 20, is being tried on a charge of involuntary manslaughter in the death of Conrad Roy III, whom she called her boyfriend. He was 18 in July 2014 when he killed himself with carbon monoxide as he sat alone in his truck in a Kmart parking lot. Ms. Carter, then 17, was about an hour away at the time. But she had urged him, through screen after screen of texts, to kill himself. This sadly mistaken belief is motivating a staggering number of depressed and discouraged American kids to commit suicide. According to the Parent Resource Program, a nonprofit organization dedicated to the prevention of youth suicide, there are an average of over 5,240 attempts per day by young people in grades 7 through 12. The charity also notes on its website that more teenagers and young adults die from suicide than from cancer, heart disease, birth defects, stroke, pneumonia, influenza and chronic lung disease combined. To help remedy the problem in California, the state legislature passed Assembly Bill 2246 in 2016, which requires school districts to adopt suicide prevention policies that target high-risk groups. These include students who are bereaved by a classmate’s death, as well as gays, lesbians and transgenders. Organizations such as the National Alliance on Mental Illness (NAMI) also have been doing their part to assist children and young adults who are having suicidal thoughts. The public health approach tasks everyone with looking for suicidal behavior and being comfortable with talking about the topic and then offering help. Suicide prevention has been an elusive topic for generations. Even doctors historically shied away from the conversation, assuming psychiatrists and families would step in when the time was right. But stigma prevents many people from opening up about depression, leading to a deadly silence that, partially, helps to explain why people kill themselves. Now, mental health experts are leading a new approach to suicide prevention that asks medical professionals to do the opposite of what has been prescribed: speak frankly with their patients. It’s a core value of the Zero Suicide initiative, which is gaining traction throughout the country. A 23-year-old man in Peru committed suicide last night, and it appears that he might have been inspired by the deceased heroine of 13 Reasons Why. Franco Alonso Lazo Medrano jumped from the fourth floor of his apartment building and People reports that he yelled “I can’t stand a heartbreak,” as his mother looked on. After surviving the fall initially, he was declared dead at the hospital. The police reportedly later found two suicide notes in his home, one of which was a farewell to a person named Claudia, and the other directing a series of tapes to be distributed to a list of people Medrano had written down. The content of the tapes has not been shared, so it is not confirmed whether or not Medrano created his recordings for people he believes contributed to his decision to kill himself, just as Hannah Baker did on the Netflix hit show, nor is it confirmed that Medrano saw or was inspired by the show. Still, the news is concerning in light of the controversy that has surrounded 13 Reasons’ depiction of suicide. Netflix has attached disclaimers and warnings to the program, but has still made enough people uncomfortable about the possibility that it glamorizes suicide for the series to be banned in certain schools. One May day five years ago, an ambulance arrived for me. My eyes were twitching, hands shaking, thoughts racing and confused. At that point, I hadn’t slept for three days. I’d taken drugs, fell asleep at the wheel, bumped into a car at a red light. I was closer to suicidal than ever, but I wasn’t sad. Instead, I was agitated, frantic, paranoid. What put me at risk was not sorrow, per se, but loss of control: the careless apathy that might swerve a bike into traffic. My therapist convinced me I needed help. A phone call later, the ambulance took me to the mental hospital, where I stayed for a week and left with lithium. Bishop Luers High School student Sarah Podzielinski has given Facebook users “13 Reasons Why Not” – a suicide-prevention video that intersperses facts with footage of classmates acknowledging those who have positively affected their lives. The teen created the 6-minute video for her freshman honors English class, but its reach has gone beyond the classroom walls. Since she posted it to Facebook on May 21, it has garnered 14,000 views, 250 shares and more than 50 comments, including some from strangers and a Washington state educator whose school was recently affected by suicide. Her mother, a mental health professional, is impressed. In all likelihood, “you’ve reached more people in 72 hours than I will in a lifetime,” Ewelina Connolly told her daughter as they sat in teacher Jessica Marlin’s classroom Wednesday. The death was startling even to the coroner: a boy only 8 years old apparently killing himself in his Cincinnati bedroom. Now Gabriel Taye’s January death is being re-examined, after it emerged that he was bullied and knocked unconscious at school two days before he died. Hamilton County Coroner Lakshmi Sammarco’s office has ruled Gabriel’s death a suicide, but she said last week that she was reopening the investigation to re-examine the boy’s injuries and whether there were contributing factors to his death. “It was very hard for me to believe that an 8-year-old would even know what it means to commit suicide,” Sammarco said. While the overall number of child deaths has decreased slightly thanks to progress in the number of infants surviving, the hazards for older children have been growing. Suicide rates and accidental poisonings, including those related to opioids, have increased, according to a new analysis of state data on birth and death rates released in the medical journal Pediatrics. For children between the ages of 1 to 19 years old, suicide rates increased from 11.3 percent of all deaths in 2013 to 12.1 percent of all deaths in 2014. Accidental poisoning deaths have particularly increased for adolescents and young adults between the ages of 15 and 24. The researchers found accidental overdose deaths in that group increased 163 percent from 3 deaths per 100,000 people to 7.9 deaths. The ongoing opioid crisis is likely one major factor for this increase, according to the researchers. A new study presented at the Pediatric Academic Societies Meeting in May found that the number of children and teens admitted to children’s hospitals for thoughts of suicide or self-harm have more than doubled during the last decade. The lead author on the study, Dr. Gregory Plemmons, is an associate professor at The Monroe Carell Jr. Children’s Hospital at Vanderbilt. There was nothing Sarah Liljedahl feared more than herself. When her mind ventured to dark places, the icy roots of suicidal ideation burrowed through her brainstem, embedded beneath her skull and took Sarah captive. When the darkness lifted, so did the ideation and Sarah knew she did not want to die. But, the thoughts always returned and, with it, the urge to kill herself. It was a deadly cycle Sarah could not escape. “At the end of it, when I would get out of that bad depression, I realized I hated myself so much there was nobody I feared more than myself,” she said. Cindy Baker of Touchstone Counseling has dealt with cases like Sarah’s for about 20 years. However, now more than ever, Baker is witnessing spikes in suicidal ideation and death by suicide that trickles down to those as young as 10 years old. Every day in the United States about 120 people commit suicide. At nearly 45,000 suicides annually, it’s the 10th-leading cause of death in the U.S. and its rate is increasing year by year, national data shows. Healthcare providers have ways to prevent a suicide attempt, but often they don’t know in advance who needs the intervention most. “We’ve been doing this for 50 years, and our ability is still at chance level,” says Jessica Ribeiro, a psychologist and researcher at Florida State University. That may soon change now that researchers like Ribeiro are getting help from technology. Instead of relying on a few well-known risk factors like depression or drug abuse, these new methods help to recognize suicide as a complex phenomenon; an outcome of many interrelated life events. 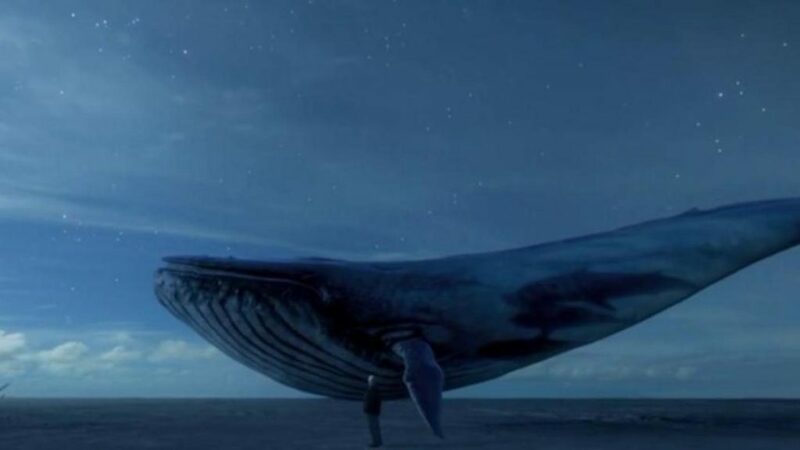 According to a report conducted by the Russian newspaper Novaya Gazeta, there should be a link between the Blue Whale game and numerous cases of teenage suicide in Russia, Kazakhstan, and Kyrgyzstan between November 2015 and April 2016: The victims had been members of VK groups dedicated to the game. However, in at least one of the cases cited—the suicide of a nineteen year-old Kazakh, Marat Aitkazin—the nature of the connection to the game can’t be confirmed. In fact, after taking a closer look at the Blue Whale phenomenon, it seems less like the shocking story Novaya Gazeta initially reported, and more like a perfect storm of internet creepypasta, media hysteria, and the very real and serious issue teenage suicide. The story rapidly exploded in the media and arrived in Europe with rather alarmist tones, to the extent that it drove a comedy television show like Le Iene to discuss it. What remains to be seen is the line that separates mass hysteria from the genuine, actual danger of the phenomenon. What a psychiatrist at Shannon Clinic says has been found in people who have committed suicide is that they have lower than normal concentrations of serotonin. In my initial discussion with Cliff Richey–a retired tennis pro–on depression, he also described this chemical imbalance as the reason for depression. Serotonin impacts an individual’s motor skills and emotions [Pictures showing the difference between a “normal” brain and a “depressed” brain are in the video story]. The treatment of which, once diagnosed, can be handled with a combination of counseling and medication. 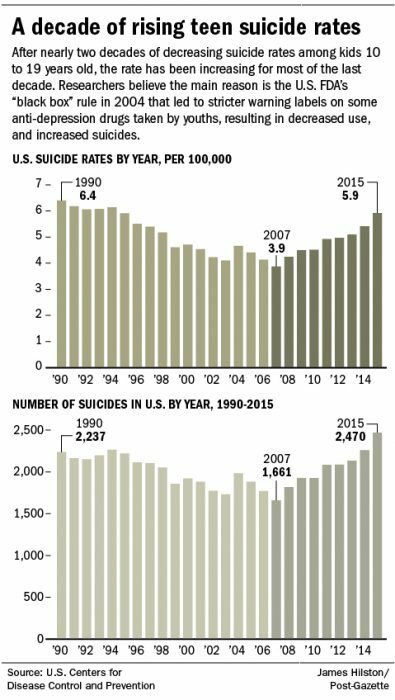 Suicide rates in the U.S. are at their highest in 30 years. In 2014, the last year for which there are official government figures, nearly 43,000 Americans killed themselves. That’s nearly four times as many as were shot to death by others. The rise in suicide comes despite intensive prevention efforts by mental health professionals, citizen-volunteers, people affected by suicide, teachers, religious leaders and others. Could the key to prevention be identifying people about to make an attempt? To intercede in the minutes or hours beforehand, you’d need a sign. But one meta-analysis — a careful examination of other studies — considered the results of 365 research articles that looked at the presence of depression, talk about self-harm, feelings of hopelessness and other factors related to suicide. The conclusion: There are no clear predictive patterns, meaning mental health workers can do little more than guess. With the popularity of the Netflix hit teenage high school show, “13 Reasons Why,” there’s been debate among mental health care professionals and researchers as to whether an actual “suicide contagion” exists. Would such a contagion effect apply to something such as a fictional TV series? Is suicide contagion a real thing? If so, is it really something we need to be concerned about as much in this day and age of instant entertainment and information available on the Internet, where people’s graphic depictions of self-harm and suicide stories are always just a single click away for any teen to view as much as they’d like? One piercing question from the January suicide of 8-year-old Gabriel Taye of Cincinnati haunts parents and teachers alike: How can a young child know enough about self-destruction to carry it out? One simple answer, say experts who deal with youth suicide, rests in our common humanity: The mind of an 8-year-old child does has the capacity to think about death, even suicide. “An 8-year-old can understand the finality of death, the irreversibility of death, even though those are kind of the two main features that go along with what you’d consider to be more of an adult view,” said Dr. Paul Crosby, chief medical officer at the Lindner Center for Hope in Mason and a psychiatrist who treats children and teenagers. Facebook has partnered with The Trevor Project, a suicide prevention hotline for lesbian, gay, bisexual, transgender and/or queer youth, to bring additional crisis support to Facebook Messenger. Back in March, Facebook brought suicide prevention tools to both Live and Messenger in partnership with organizations like the Crisis Text Line, the National Eating Disorder Association and the National Suicide Prevention Lifeline. Facebook’s lineup of partners, which now includes The Trevor Project, enables people contemplating suicide and/or feeling depressed to immediately, directly connect with them. Chat functionality with The Trevor Project will roll out over the next few months. Worldwide, there is a suicide attempt every 40 seconds, according to the World Health Organization. Among those aged 10-24 years old, suicide is the second leading cause of death, according to the Center for Disease Control and Prevention. The last time Kathy Shott spoke to her son was shortly before Christmas 2013. She recalled that he was sad — the 31-year-old was going through a divorce — but he also seemed to be looking to the future. She said he thanked her for the socks she had sent to him in Missouri and mentioned they would come in handy when he returned to work. “Mom, don’t ever forget how much I love you,” she remembered him saying over the phone. On Christmas Day, he took his life. It’s a story Shott, who lives in San Diego, has told multiple times since the death of her son, an Iraq War veteran who served in two branches of the U.S. military. She shares it in support groups that help people who have lost loved ones to suicide. There is a simple, one-question quiz that every physician, teacher, politician, parent, brother, sister and good friend should pass with flying colors. What is the No. 1 non-accidental cause of death in young people 10 to 34 years old? In fact, suicide claims more young people than cancer, diabetes, heart disease, cystic fibrosis, influenza, pneumonia and other infectious diseases combined. A security camera video taken inside a Cincinnati elementary school reveals that a student assaulted an 8-year-old boy in a restroom and other children may have kicked and struck the boy for 5 minutes while he lay unconscious. School officials did not tell Gabriel’s mother about the assault or that he had lost consciousness, only that the boy had fainted, said Jennifer Branch, a lawyer for the boy’s mother. Gabriel’s mother has agreed to identify her child publicly but did not wish to release her own name. My depression was a dark presence that first came when I was 12 years old and revisited often. Finally, at the age of 26, I started taking an antidepressant, and that helped tremendously. Then I started losing hair, an uncommon side effect, so I stopped. My new therapist in Austin, a psychiatrist, wanted me to try a different antidepressant. But my mind already had tricked me into thinking nothing could possibly help, and even if it could, I did not deserve it. The online social media game reportedly targets at-risk participants, taking them through a series of challenges over 50 days that culminate in suicide. New Zealand police have already warned parents to be wary of the game. The challenges include waking up at 4am every day, watching violent videos, and self-harming. A difficult sibling’s tragic death is the catalyst in “32 Pills: My Sister’s Suicide.” But if documentarian Hope Litoff initially expects belatedly confronting the titular event will result in some sense of inner peace, she — and everyone around her — are alarmed when instead the “process” sends her down a personal rabbit hole of guilt, denial and addiction. Gripping and discomfiting, this first directorial feature by the veteran editor is the kind of diaristic inquiry that can seem self-indulgent but here sports a fearlessness that transcends vanity — at times it’s downright unflattering. In late 2008 photographer Ruth Litoff was found in her Manhattan loft, having finally “succeeded” after 20 or more suicide attempts over many years. Police on the scene said they’d never seen anything like it — her entire apartment was meticulously prepared for the event, with umpteen notes, presents, etc., left labeled with instructions for disbursement to various friends and family. Wilkins Kearney left a note for his wife on the kitchen counter, propped against their wedding picture. It began, “To dear Lilla,” and ended, “I love you so much!” Then he pulled open a drawer and took out his gun. His suicide seemed to come out of nowhere for his tight circle of friends and family. Looking back now, they remember no warnings, no signs of depression, nothing but the long, solitary runs he would sometimes take when work or life got him down. He was always just the same old Wilk, a loyal friend with a streak of mischief in his grin. “An active participant in life,” one close friend said. For years, public-service campaigns have stressed that suicide is preventable, that people can save a life if they just catch the warning signs early enough. But a recent RAND study found that the truth is much more complicated. In our search for answers, it concluded, we may have been looking in the wrong place. With its gripping story, visceral emotions, and penchant for stirring up controversy, Netflix’s 13 Reasons Why has also begun several difficult discussions about suicide. Specifically, the way it’s portrayed onscreen, and how we can be better at handling mental health issues IRL. So what can you do to help friends who are talking to you about hurting themselves? A lot, it turns out. As the community comes to grip with the tragedy at Farragut High School, one issue that must not be ignored is the role of guns in suicides. Two of the three young men who have died this semester used firearms to take their own lives. Tragically, they are far from alone. Each year, about 33,000 Americans die of gunshots, according to the Brady Campaign to Prevent Gun Violence. Of those, some 20,000 are suicides. Without easy access to guns, many of those deaths would not have happened. When David Brent helped start the STAR Center at the Western Psychiatric Institute and Clinic 30 years ago, the field of youth suicide prevention “was scary,” he said. Educators and school mental health professionals across the country are warning parents about the Netflix series “13 Reasons Why,” saying the show’s graphic depiction of a teenager’s suicide could contribute to a “contagion effect” among students with mental illness and linking it to self-harm and suicide threats among young people. The show has prompted a major response from educators and administrators, who have spoken at PTA meetings, sent messages home and even cautioned certain groups of students about whether to watch it at all. “There’s no room for error when it comes to student wellness,” said Rebecca Aguilar, who oversees school counselors at Thoreau Middle School in Fairfax County, where school officials sent home a list of talking points advising parents about the show. The Injury Control Research Center for Suicide Prevention (ICRC-S) is hosting a webinar on nightmares and suicide risk. Michael R. Nadorff, assistant professor of psychology and director of clinical training at Mississippi State University, will review the literature on nightmares and suicide, and discuss how nightmare treatments may hold promise for reducing suicide risk. Barry Krakow, founder of Maimonides International Nightmare Treatment Center, will focus his presentation on Imagery Rehearsal Therapy, which is a recommended treatment for nightmare disorder. The webinar will be held on May 9 from 3 to 4 p.m. ET. Netflix has been accused of dangerous sensationalism. But how best to tackle this traumatic subject? We talk to YA novelist Chloe Combi and director Katie Mitchell. If there was a list of ways not to portray suicide, this would tick every box. The new Netflix series 13 Reasons Why, adapted from the novel by Jay Asher, is about a teenager called Hannah Baker who takes her own life. She leaves behind a set of cassette tapes, each addressed to a different person in her life, detailing how they hurt her and contributed to her death. It’s a revenge fantasy, so it portrays suicide as an act that will achieve something. It’s aimed at a young audience, who are particularly susceptible to contagion, and particularly likely to experience suicidal thoughts. It normalises and legitimises the act. It goes into too much and too graphic detail about the suicide itself – which is expressly against Ofcom guidelines because, however horrible it is to watch, this can still be read as a how-to. The series depicts suicide as a reasonable response to a set of challenges that anybody might experience, and lays it at the feet of other people. It’s wrong from so many angles that it’s almost as if it were devised as a training manual for how not to use suicide as a plot point. Pennsylvania middle and high schools are now required by Act 71 to provide faculty and student training on the topic of suicide prevention. The largest piece of this training requirement is the 4‐hour faculty component for those working with grades 6-12. The Western PA chapter of the American Foundation for Suicide Prevention (AFSP) presents this free workshop to demonstrate to school trainers our school-focused suicide prevention content and best practices to meet these Act 71 requirements. We are pleased to oﬀer this at no charge, to help our schools while supporting our organization’s goal to reduce the suicide rate in PA and in the U.S.
“More Than Sad” is AFSP’s school‐ready and evidence-based training speciﬁcally designed for teen‐level suicide prevention. More Than Sad has been used across middle and high schools in the U.S. for several years. Workshop attendees will gain a full how‐to demonstration on training faculty with the mixed‐media methodology, which fulﬁlls about 3 hours of faculty training. AFSP representatives will also recommend additional content to meet the full 4‐hour training requirement, including the bullying-suicide connection and how to appropriately respond as a school should a suicide occur. A teenage suicide game spreading from Russia raises the same urgent questions everywhere, including Brazil, where my Bloomberg View colleague Mac Margolis just spotted it: Who is responsible? How do we stop them? While social networks and the parliament in Russia have moved to eliminate so-called “groups of death,” they may well be fighting an urban legend. But the obvious threat is well established: the tragically high suicide rates in countries struggling after the fall of the Soviet Union are a result of much broader societal ills. The E-Team broke the story on News 5 in February that one in five high school-aged students enrolled in Cleveland Metropolitan School District tried to kill themselves in 2015. It’s the highest suicide-attempt rate out of any major urban school district in the United States. The stressors of being a teen are elevated in Cleveland, where more than 70 percent of the student population lives in poverty and estimated 4,000 students are homeless. But there is help; in the same way schools protect a student’s safety, in Cleveland, they’ve now learned they need to protect a student’s soul. One story struck me most this week. It was not the snap election in the UK. It was not the posturing of North Korea and America’s response. It was not the firing of Bill O’Reilly. It was not the historic pay equity deal, or the immigration tweaks and debate. It was Prince Harry’s remarkable 27 minute interview with the Telegraph where he told of 20 years of grief and depression. It began with his mother Diana’s untimely death, his recovery, and acceptance in recent years. It was a story that many can relate to. A story of loss and regret and an unhealthy response. But this was a Prince of England. A member of a firm that values image, duty and a stiff upper lip. And here he was telling the truth. We remember the little boy marching with his brother and uncles behind his mother’s coffin. The boy who broke all our hearts. The boy who developed into a troubled man and then over recent years gained our respect. Here he was revealing his 2 decades of grief. Teens and young adults who come from troubled backgrounds have a greater risk of killing themselves, a new study suggests. Kids exposed to suicide in the family, parental mental health disorders and substantial parental criminal behavior had the highest suicide rates, the study found. The findings “emphasize the importance of understanding the social mechanisms of suicide and the need for effective interventions early in life aimed at alleviating the suicide risk in disadvantaged children,” according to study author Charlotte Bjorkenstam from the Karolinska Institute in Sweden, and her colleagues. People who don’t want to live need professional help. You can’t save them with kindness. A long talked-about suicide barrier is being installed on the Golden Gate Bridge. Officials gathered at the Golden Gate Bridge Thursday to mark the start of work on a long talked-about suicide barrier that families of suicide victims hope will prevent other deaths. More than 1,400 people have jumped to their deaths since the bridge opened in 1937. Their survivors have lobbied bridge authorities for some kind of barrier. “As satisfying as this is and seeing everyone here, we wish the occasion was for something else,” said John Brooks, who lost his daughter, Casey, to suicide in 2008 when she was 17. It will cost more than $200 million to install the stainless steel netting along the length of the 1.7-mile (2.7 kilometer) bridge. Bridge officials say the project will be completed by 2021. Everyone’s woken up in the middle of the night from a nightmare, a little panicked and uneasy, only to remind themselves it was just a dream. But according to a new study, nightmares — especially frequent ones — can have serious repercussions in real life. Researchers in Finland found that such dreams slightly increase the risk of suicide in the general population. Nightmares are intensive dreams with negative emotional tone. Frequent nightmares can pose a serious clinical problem and in 2001, Tanskanen et al. found that nightmares increase the risk of suicide. However, the dataset used by these authors included war veterans in whom nightmare frequency – and possibly also suicide risk – is elevated. Therefore, re-examination of the association between nightmares and suicide in these data is warranted. We investigated the relationship between nightmares and suicide both in the general population and war veterans in Finnish National FINRISK Study from the years 1972 to 2012, a dataset overlapping with the one used in the study by Tanskanen et al. Our data comprise 71,068 participants of whom 3139 are war veterans. Before he was vice president for student affairs at Marquette, Xavier Cole found himself dealing with a student death by suicide. Added to the tragedy was extensive media coverage that garnered public attention. An 11-year-old Michigan boy’s death last week — three weeks after he hanged himself — has drawn national attention to youth suicide prevention and how that intersects with social media. Police in Marquette, Michigan, say they have brought charges against an unidentified juvenile after a boy was found unresponsive following a reported suicide attempt on March 14. Though authorities declined to identify either child involved, Katrina Goss told PEOPLE her son Tysen Benz was the boy who died. PEOPLE spoke with multiple experts to better place Tysen’s case in context and to provide information and resources for other families. The experts reiterated a common point: Suicidal crises can be overcome with help, and help is out there. Charges are pending against a juvenile after a Michigan mother said a social media prank in which her 11-year-old son’s girlfriend faked her own suicide led the boy to take his own life. Katrina Goss said Thursday that she found her son, Tysen Benz, hanging by the neck March 14 in his room after seeing social media posts and texts that his 13-year-old girlfriend had killed herself. An Encinitas high school student who lives near the coastal railroad tracks wants to take rail safety a step further. Kassidy Kanner, 18, recently launched a campaign calling for suicide-prevention signs to be installed along the Leucadia stretch of the rail line where two people have died this year, including a man who was fatally struck by a train on March 15. Nearly 12,000 people have already signed Kanner’s online petition in support of the signs, which would display a hotline number and messages urging suicidal people to seek help. Similar signs have been installed by transit districts elsewhere in the country, including Northern California, Pennsylvania and Illinois. There were seven teen suicides in Butler and Warren counties last year, and three of them were committed by Middletown High School students. Whatever the challenges Middletown residents are facing are also felt in the high school hallways, said MHS Principal Camela Cotter in an exclusive interview with the Journal-News. Of the recent incidents, Cotter said that two students committed suicide over the summer and a third over Christmas break in 2016. Suicide is the third-leading cause of death, after accidents and homicide, for 15- to 24-year-olds, according to the Centers for Disease Control and Prevention. It’s also thought that at least 25 attempts are made for every one teen suicide completed, the agency said. TWO brothers, both in the prime of their lives and both lost to suicide. Hayden Houlton is only 26 but knows the horrific toll that ­suicide can wreak on a family. His elder brother Ben took his own life aged 20 and two years later his younger brother Jason also committed suicide, at the age of 17. For years, worried about his brothers’ privacy and his family being perceived as “weak”, the medical student from Sydney’s northern beaches did not talk about the impact of such a heartbreaking loss. His life fell to pieces. He shut himself off from friends, began overeating and became depressed. It was only through a support network of loved ones and mental health experts that he came back from the edge. And it was only the thought of being able to help someone else that gave him the strength to talk about his experience. An oversized red bandanna covers her small head of brown hair. She’s missing a tooth. She stands in front of flowery green and gold wallpaper, her cherubic face exuding warmth and innocence. Blessing’s painting, along with nearly 50 other high-quality pieces in the exhibit “What’s Left,” can be enjoyed, safely, from afar. But these artists hope we will step closer, cross the line of comfort and denial, to a more intimate space. A space where honest dialogue about mental illness and suicide can begin. “I want people to see the person and not the illness,” said John Bauer, a Grand Rapids, Minn., public radio host who produced the exhibit and is taking it across Minnesota.